German "Milk Technician" Klaus Burkart Crowned Mr Gay World 2015 - Got Milk? Home/Entertainment/German “Milk Technician” Klaus Burkart Crowned Mr Gay World 2015 – Got Milk? 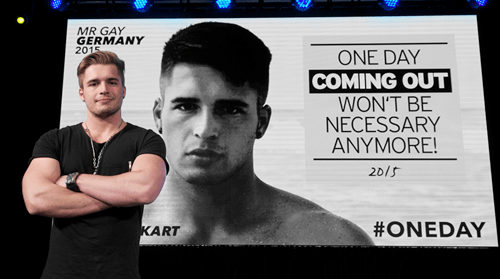 Twenty-one-year-old Mr Gay Germany Klaus Burkart has won the title of Mr. Gay World 2015. Burkart, a “milk technician” was presented with the Mr Gay World sash and trophy by 2014 winner Stuart Hatton in Cape Town, South Africa on Saturday night. He added that he is planning a campaign to visit schools and talk about how to avoid bullying and gay bashing. According to results published by Gaynz.com, the top four contestants Troy Michael Jonsson (Iceland), Jordy De Smedt (Belgium), Tomi Lappi (Finland), and Emmanuel Mass Luciano (Hong Kong). There was no delegate from The United States. Now about Klaus’ milking talents…….